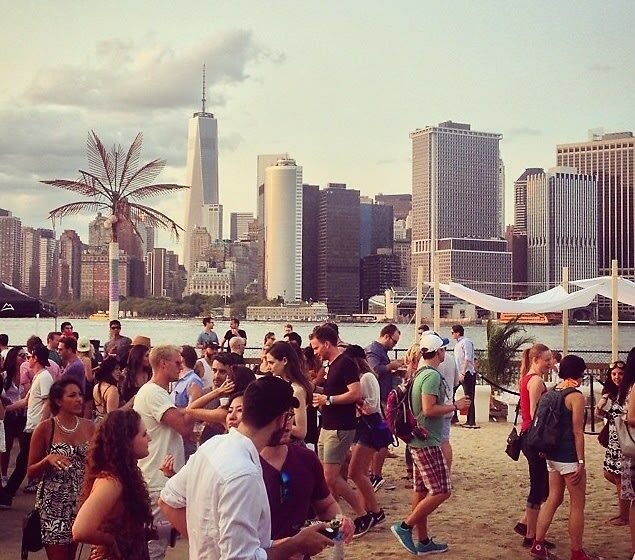 On Friday MATTE Projects brought their annual Full Moon Festival to Governors Island. Thousands of New Yorkers took a quick ferry ride over to enjoy the one-day festival, which featured some of the most popular names in the indie-rock and electronic genre. Upon entering, guests immediately made their way to the beach, which offered a unique and breathtaking view of downtown Manhattan. The music came from both DJs and live bands, who performed an eclectic mix that kept the crowd dancing all day. The mysterious, masked Claptone offered his take on deep house and UK garage to get the crowd going, while Young & Sick performed rock songs which quickly made them a fan favorite. While the crowd danced to their favorite tunes and discovered some of these new acts, they also indulged in the other offerings throughout the festival grounds. Both the face-paint and temporary tattoo stations were among the most popular destinations, judging by the amount of people sporting the various styles on their bodies. The food was one of the highlights of the festival as well. MATTE Projects enlisted the likes of Tacombi, KoSo Fresh, and Mile End to provide tacos, korean rice bowls, and delectable hot dogs, among many others. Guests, which included notable New Yorkers such as Danielle Bernstein, Harry Beee, Rameet Chawla, and Laura Polko, washed it all down with refreshing Rekorderlig hard cider, beer, and the special festival cocktails made with Absolut and Beefeater. The day quickly turned to night, with acts like Waveracer and Penguin Prison turning the event into an all-out dance party leading up to headliners The Knocks and Delorean, with a surprise performance by Kiesza to close out the spectacularly entertaining festival. Click through for some of our favorite photos from the 2014 Full Moon Festival! Go HERE to read our interview with the founders of the festival organizer MATTE Projects!